The Model SR445A 350 MHz Preamplifier contains four wide-bandwidth, DC-coupled amplifiers, each with a gain of 5. The four channels may be used independently, or cascaded to provide a total gain of up to 625. The fast rise time, low noise, and excellent DC accuracy of the SR445A make it an ideal instrument for amplifying the outputs of fast photomultiplier tubes and photodiodes. 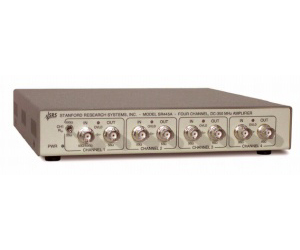 The SR445A can be used to improve the sensitivity of oscilloscopes, photon counters, boxcar averagers, spectrum analyzers, and other high-frequency test equipment. Each channel has an input and output impedance of 50 W. The input impedance of channel 1 can be increased to approximately 500 W by a front-panel switch. This can improve the sensitivity of signals from current and charge output devices, such as photomultiplier tubes. Each channel has a separate offset adjustment allowing you to quickly null DC errors.